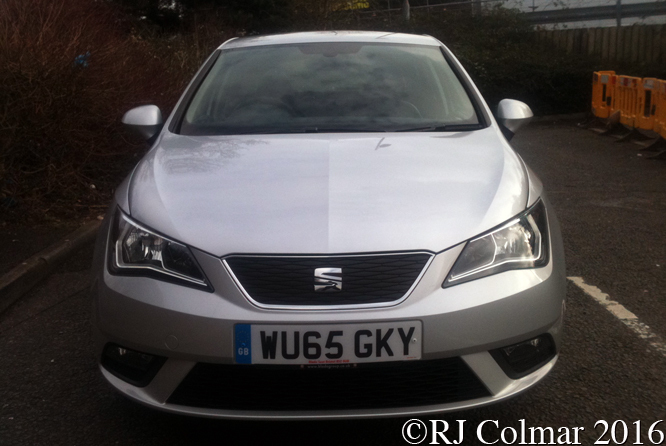 Just over a month ago I got a call from SEAT telling me my company SEAT Toledo TDI was due for some warranty work and they kindly arranged for me to take it in to my local dealer Blades, on Feeder Road in Bristol, who were to provide a loan car for the couple of hours it would take for the work to be completed. 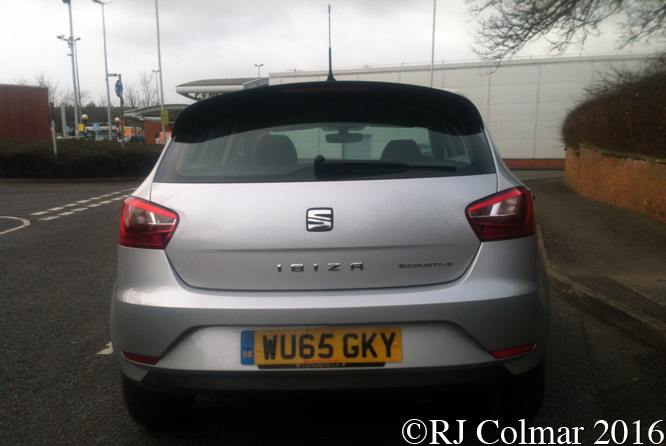 Having a job where I am on call five days on and five days off I find it quite difficult to keep track of the day of the week so when I turned up at Blades I found I was in fact a day early, but that was no problem and the service receptionist kindly summoned today’s featured 4th generation face lifted SEAT Ibiza SE Ecomotive TSI for me to drive from one of her colleagues. I planned to use my time off with the loan car to go and get some of my favorite Mendip creamed honey from Web Stile Farm a couple of miles off the A37 in Hinton Blewett and as often happens when swapping from diesel powered cars to petrol power I applied slightly too much pressure to the throttle as I left the premises and on this occasion was greeted by the delightful sound of the free revving 1 litre / 61 cui 3 cylinder turbo and supercharged engine which immediately brought a smile to my face. 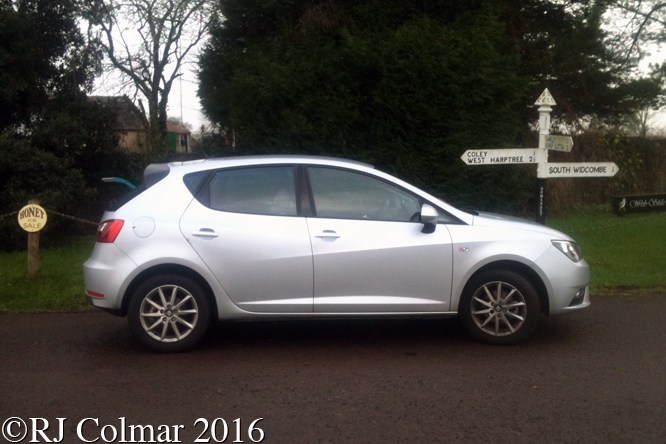 By the time I had left the outskirts of Bristol I was thoroughly warming to the sound of little TSI engine which was much smoother than a 4 cylinder, but not quite as growly as a 5. 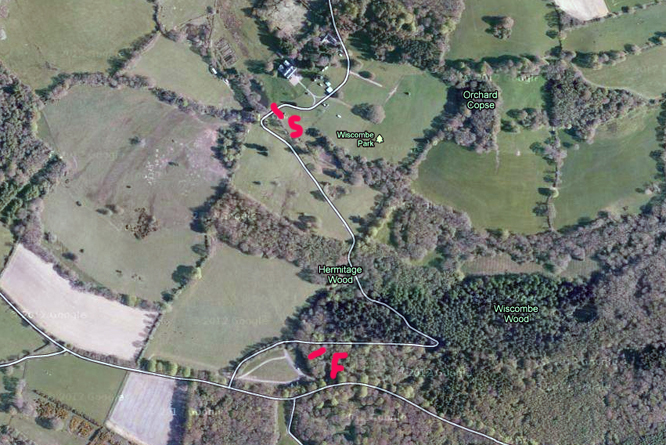 Having picked up a couple of jars of honey I decided to pursue a route I discovered, with my friend Tim Murray, last year when planning a treasure hunt for the Bristol Pegasus Motor Club towards Burrington Coombe. 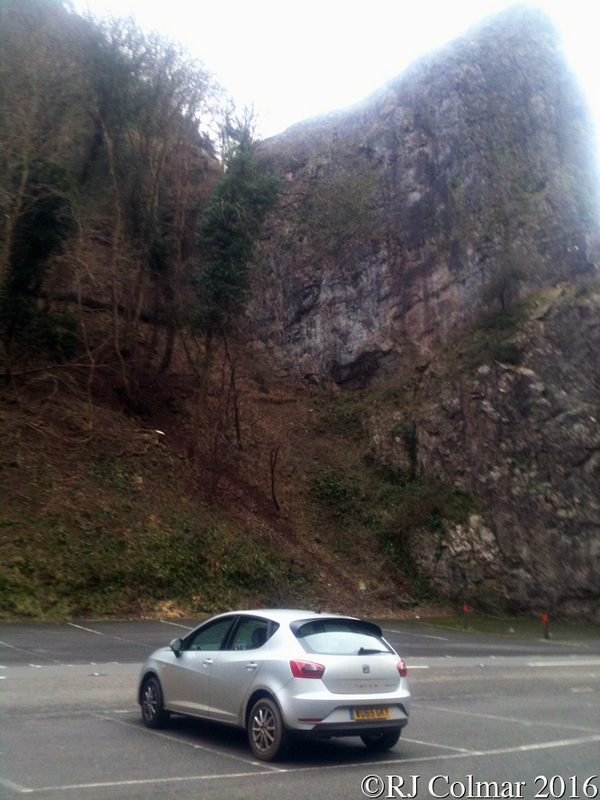 Driving down the empty windy B3134 was so much fun that once I had stopped to take a photo or two at the bottom, I had no hesitation driving back up it and then round to Cheddar Gorge from whence I completed a loop back to Burrington Combe and back up the B3134. Having enjoyed the handling and the sound of the harmonious little 95hp 3 cylinder with the six speed transmission I reluctantly headed back to Bristol, trying a 30 mph rolling brake check on a particularly muddy uneven empty road and it was no surprise that with the ABS kicking in the car stopped in a remarkably short distance straight as a die. With the car now covered in several buckets of Somersets finest red mud I drove the little loop up and down the M32 and stopped off to vac and jet wash the car at Sainsbury’s in Harry Stoke. When checking the odometer I discovered 72 fun filled miles had been covered on the honey run in the stylish Ibiza which I filled up with 9.04 litres / 2 Imperial Gallons of unleaded which turned out to be comfortably more than had actually been used. 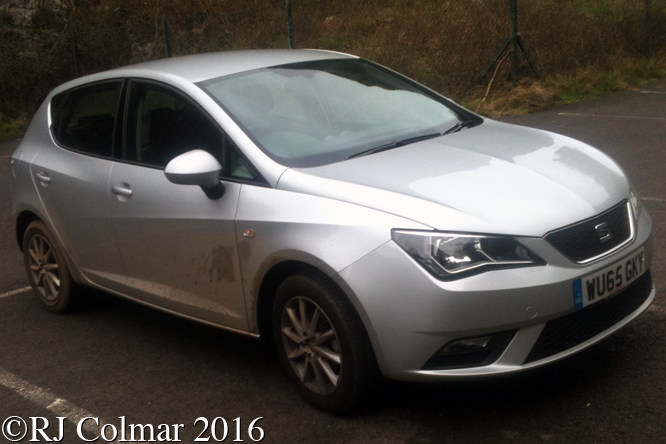 Just as I had finished cleaning the Ibiza I got a call telling me my Ambulatory Toledo TDI was good to go and so I headed back to Blades where with many new fond memories I exchanged the key’s with the Service receptionist. 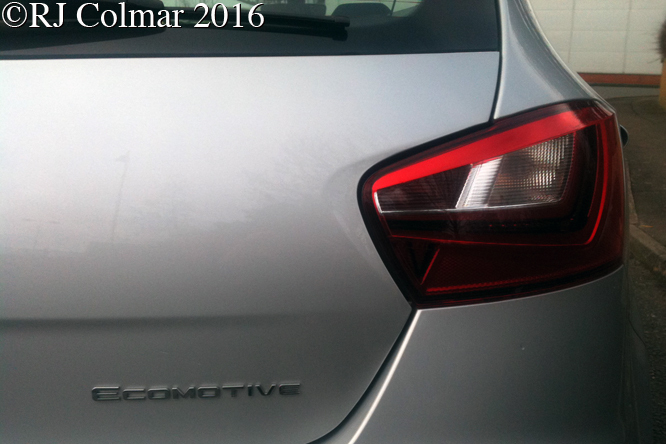 In the 30 year history of German magazine Auto Bild’s 100,000 km / 60,000 mile road tests the 2011 Ibiza scored not only the best small car results for vehicles in the VW Group but also the best result for any small car ever tested over that distance by the magazine. Thanks for joining me on this “Turbo Super Party 3” edition of “Gettin’ a li’l psycho on tyres” I hope you will join me again tomorrow when I’ll be looking at a Convertible Camaro. Don’t forget to come back now ! 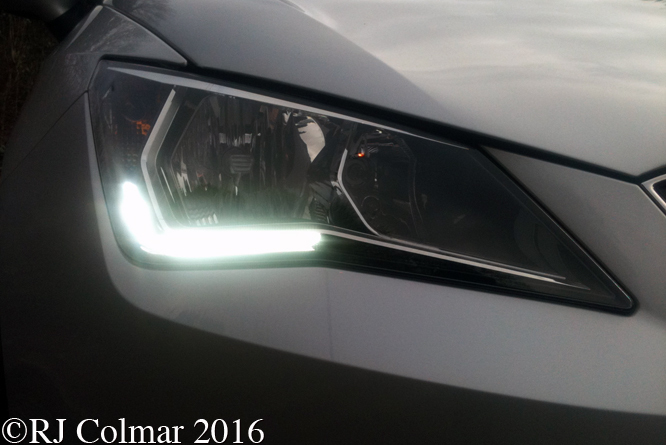 This entry was posted in Uncategorized and tagged Auto, Bild, Blades, Blewett, Bristol, Burrington, Club, Colmar, Coombe, Creamed, Ecomotive, Farm, Harry, Hinton, Honey, Ibiza, Mendip, Motor, Pegasus, Psychoontyres, Ralph, SEAT, Somerset, Stile, Stoke, TSI, Web on March 9, 2016 by Ralph. Visitors to the 1934 New York Auto Show were stunned by the appearance of the Chrysler Airflow with it’s aero dynamic shape and the comfort promised by mounting the engine over the front axle and moving the rear seats ahead of the rear axle. Unfortunately, not for the first time nor the last, the futuristic Airflow did not sell as well as might be expected, despite it’s superior agility and comfort, so subsequent Airflow models became more conservative in their design. 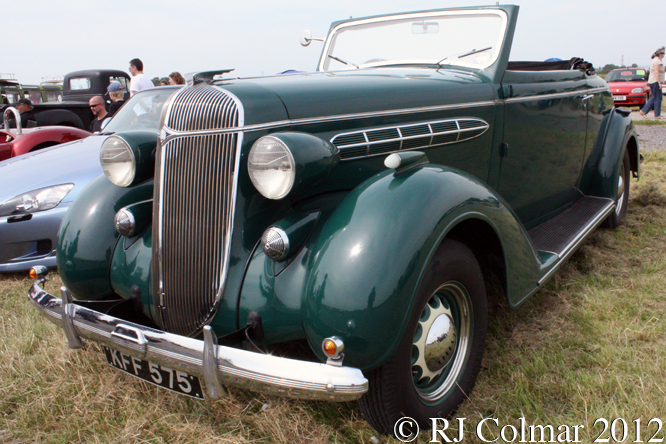 The 1936 Chrysler Six C7 Convertible seen here is powered by a 241.5 cui / 3,957.5 cc flat head straight six, who’s origins can be traced back to 1924, with an automatic choke ensured easy starting. 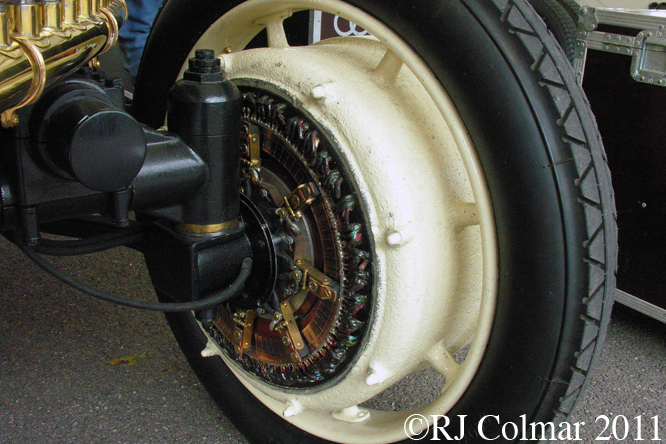 A new rear axle which promised silent running thanks to it’s hypoid gears, a spiral bevel gear whose axis does not intersect with the axis of the meshing gear, was introduced to the 1936 C7 range with automatic overdrive an option to further reduce the vehicles noise at speed. 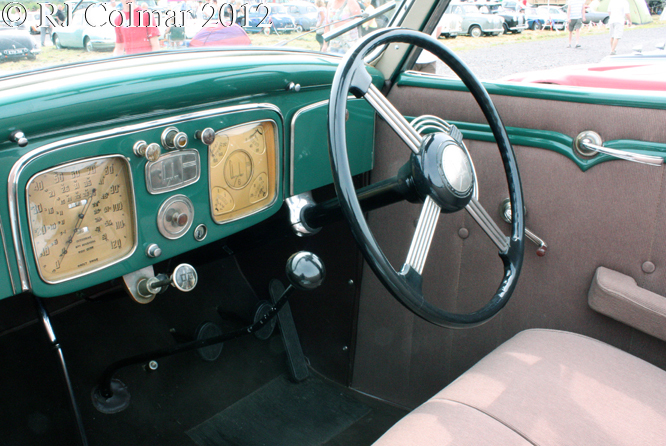 The rare right hand example, seen here at Summer Classics Easter Compton, almost certainly a conversion as the speedometer is on the passengers side, is showing as first registered in the UK on the 1st of April 1994, it is also showing as having a 2.7 litre 167 cui motor, a detail I suspect is at variance with the facts since there was no Chrylser 4,6 or 8 cylinder motor of that size that I know of, if you know different please do not hesitate to chime in below. 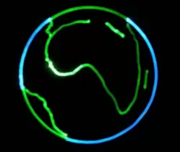 Thanks for joining me on this “Silent Running Hypoid Gear” edition of “Gettin’ a li’l psycho on tyres”, I hope you will join me again for Ferrari Friday tomorrow. Don’t forget to come back now ! 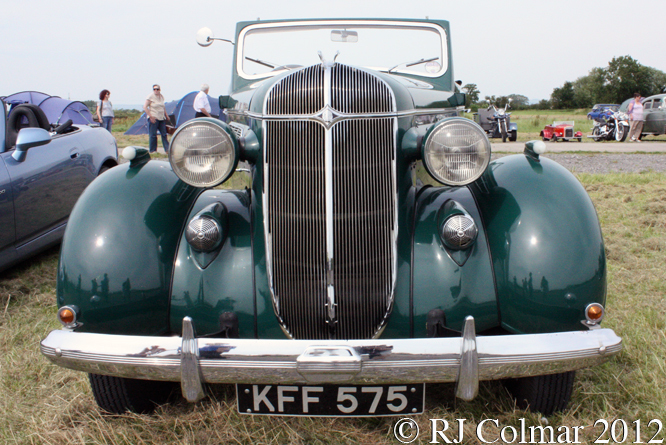 This entry was posted in Uncategorized and tagged Airstream, C7, Chrysler, Classics, Colmar, Compton, Convertible, Easter, Hypoid, Psychoontyres, Ralph, Rumble, SEAT, Six, Summer on December 10, 2015 by Ralph. Shortly after dawn on Saturday morning I found myself cruising across the Somerset levels headed for Wiscombe Park in deepest Devon where the Woolbridge Motor Club was running a fully subscribed hillclimb where I found myself being assigned to the Esses 2 marshals post with two seasoned marshals from Melksham. The 1000 yard course at Wiscombe Park was first used in 1958 and the course record is currently held by Aylesbury’s Trevor Willis who recorded a time of 33.92 seconds in his OMS 25 Powertech in July last year. The marshals post Esses 2 is situated on the outside of a sweeping corner and afforded a great view of the action as cars clipped a huge tree at the apex of the corner. 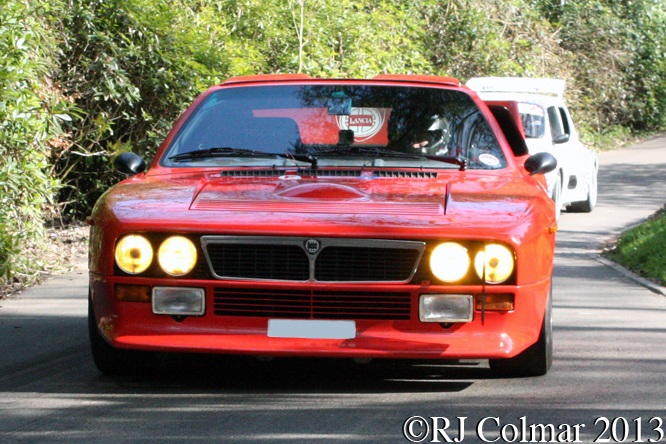 All of today’s photo’s were taken as the vehicles returned from the top of the hill to the paddock. 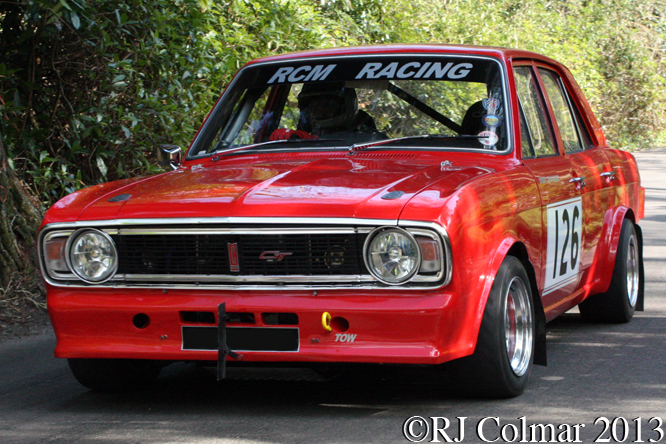 Jenny Howells shared this 1968 Hillman Super Imp with her husband Alex. 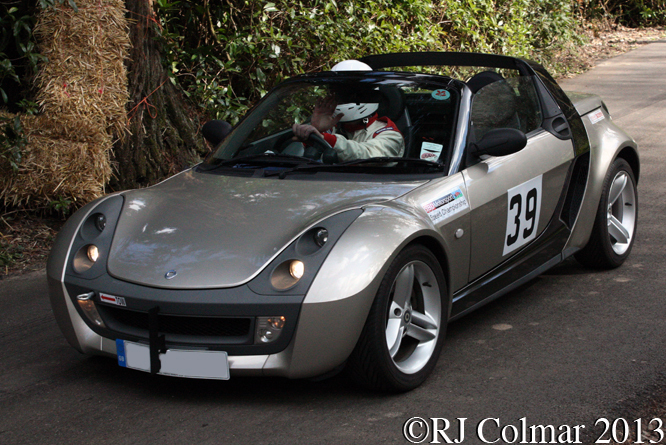 Running in the same Road going cars up to 1400 cc class and a little faster was Peter Hodson in his Smart Roadster Turbo. 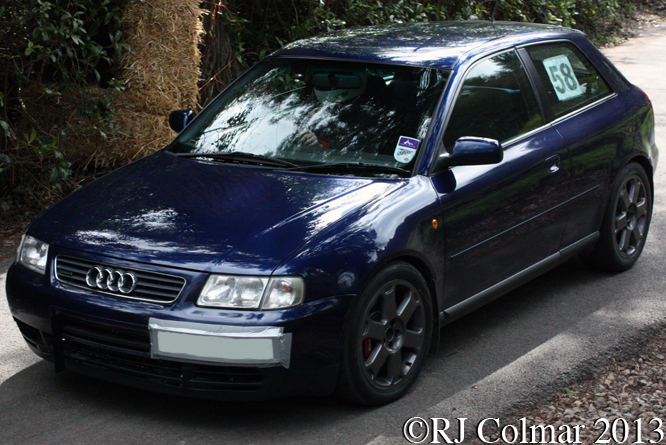 Fastest in the over 1800 cc Road going class was the Audi A3 Turbo quattro of Anthony Wright who made a fastest run of 45.15 seconds around half a second faster than his nearest challenger. 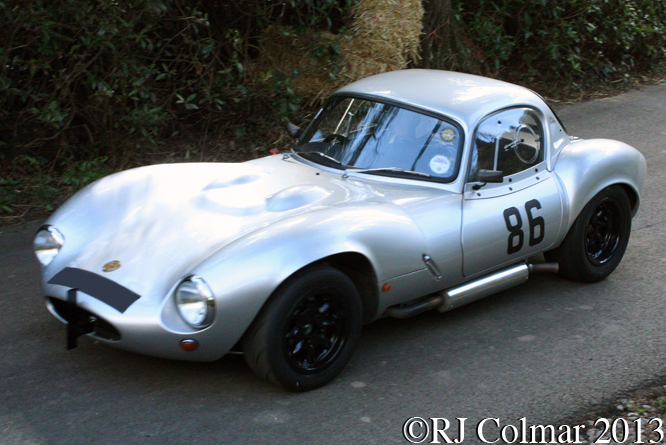 Last time I saw Roger Coote’s Ginetta G4 in action was at the Great Western Sprint when it was freezing, what a difference a couple of weeks makes. 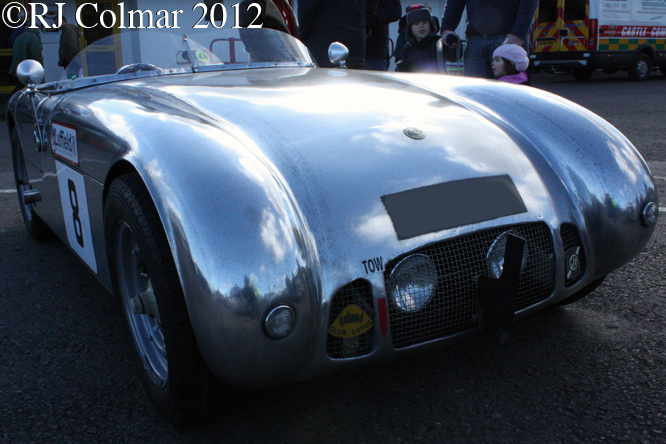 On this occasion Roger finished third in the Specialist Production B2 class. 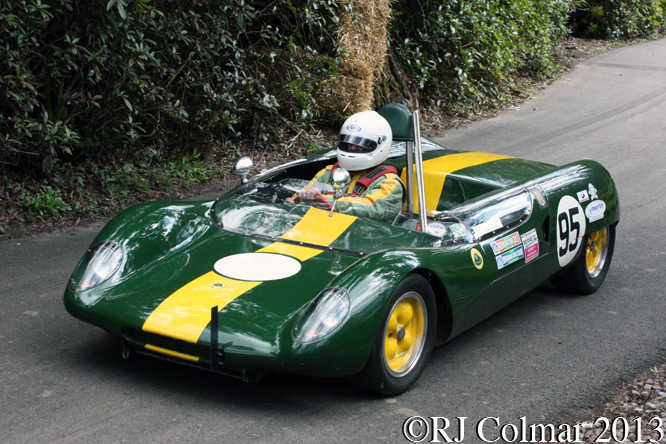 Cliff Conibear proved to be a model of consistency recording identical times of 45.96 seconds on both of his runs in his Lotus 23B, good enough for 5th in the Road going B3 class. 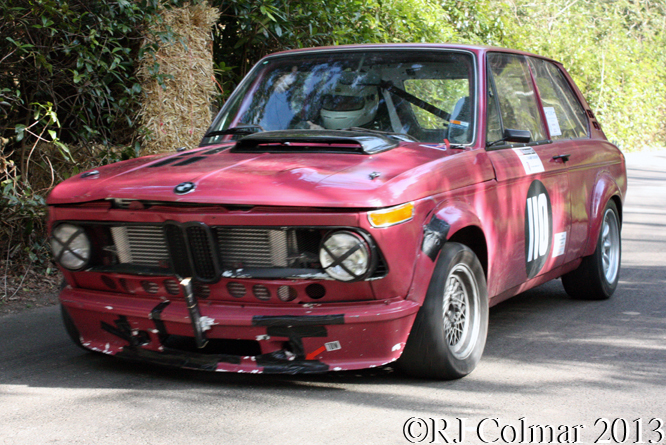 James Hunt’s BMW 2002 Touring shows signs of savaging the tree on the entry to The Gate on his second practice run, he made amends by finishing both of his timed runs recording fourth fastest time in the modified production C3 class. 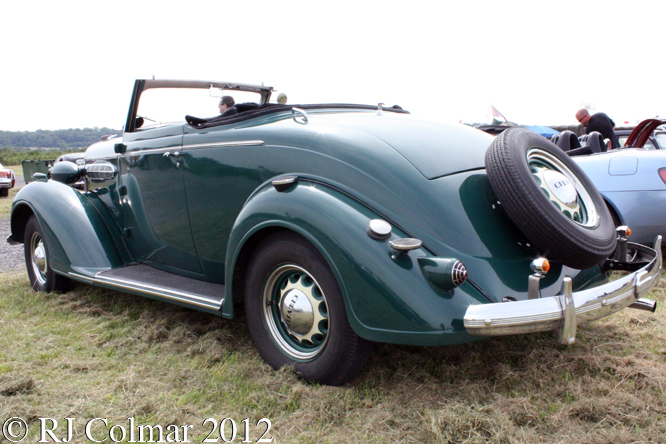 Another car that seems pop up frequently in my travels is John Biggs Kayne Special III which looked far happier at Wiscombe Park than it did at the Great Western Sprint when I saw it last. 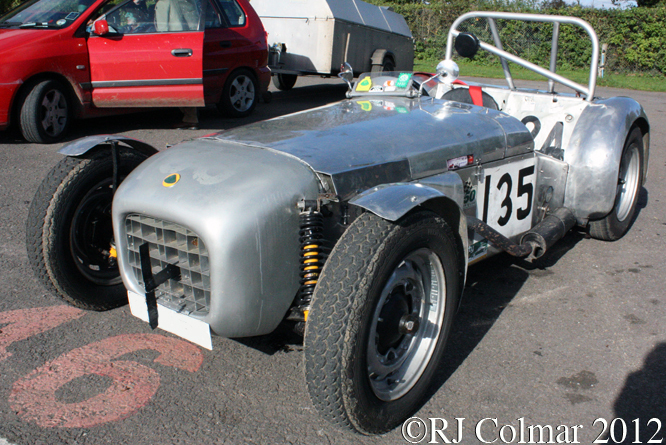 John who finished 3rd in the Sports Libre D2 class tells me he has tested the Rover V8 powered Kayne Special III at over 140 mph and looks forward to giving it a run in a race at Silverstone in the near future. 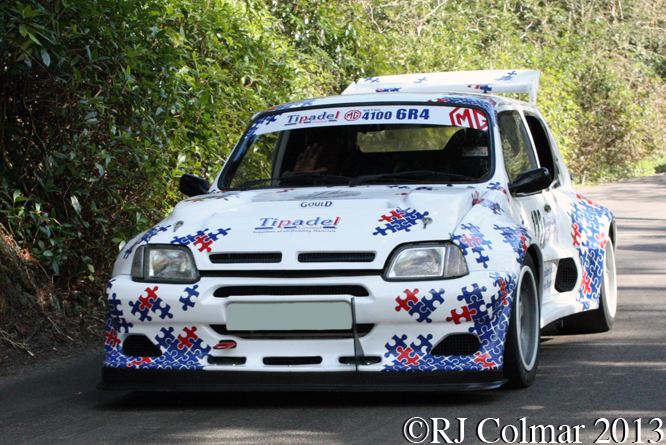 Competing in the same class as the Kayne Special as the Kayne Special were Andy Fraser and Tim Painter who shared this MG Metro 6R4 DAM 4100 which features a space frame chassis built by Dave Appleby Motorsport, the running gear from the steel shelled MG Metro 6R4 and a post 1995 Rover Metro style body. 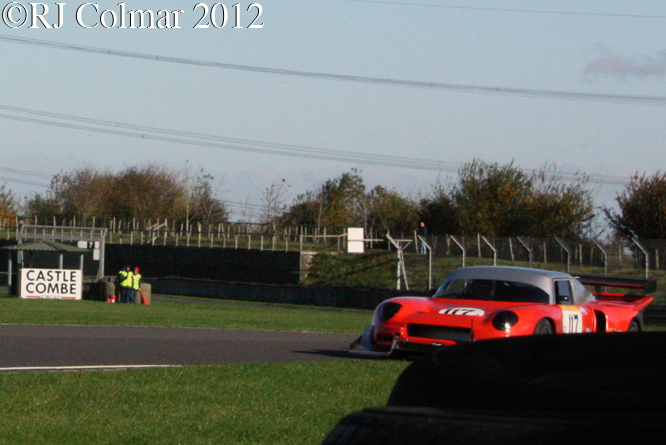 Andy seen at the wheel here proved faster than Tim and won the D2 class. Craig Moore is on a mission to threepeat his Bridge Tyres & Wheels Wiscombe Park Hill Climb Championship wins in 2011 and 2012 with his 4 door Ford Cortina 1600 GT, being the first person to win back to back championships he is now looking to become the first man to win three championships in a row, he started his campaign with a second in the Rally Cars class D4 on Saturday. Like the MG Metro 6R4 the Lancia 037 Stradale was built for Group B rallying it would appear the Robert Wadsworth example is one of the 200 037 road cars built to meet the mandatory homologation requirements. Robert finished third in the Rally Car D4 class. 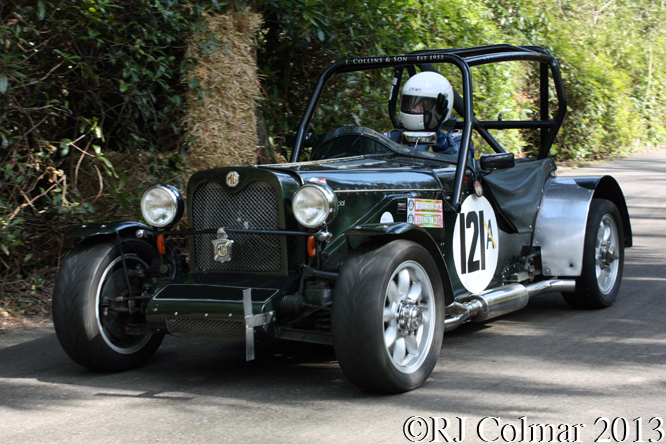 Gordon Hicks #19 was listed as a Megapin HC3 open wheeler but a check of the licence plate reveals that he was actually driving a SEAT Altera Freetrack TDI 4WD in the Road Going A3 class in which he finished with the ninth fastest time. 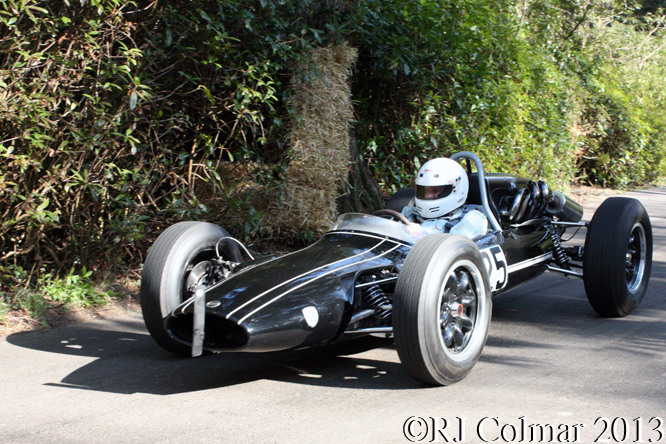 The Cooper T65 was designed to compete in the 1963 Formula Junior series against the Lotus 27. 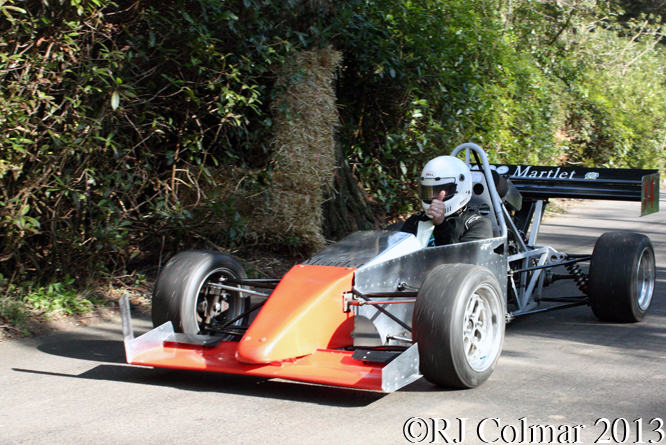 Reg Broome drove his car running with a 1598 cc / 96.7 cui motor recorded 7th fastest time in the E2 Racing cars class. 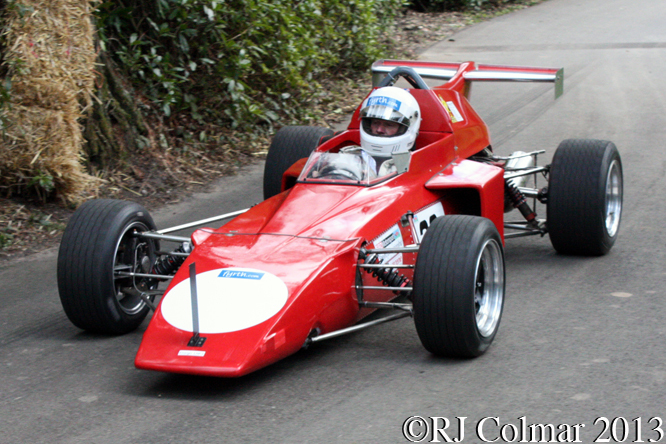 Running a similar motor to the Coopper T65 Bristol’s Fyrth Crosse drove his early 1970’s Ensign LNF3 Formula 3 car to a fifth fastest time in the E2 class. Maidenhead’s Adam Steele had a mishap at the entry to The Gate on his first timed run, despite spinning he avoided hitting anything and on his second timed run he recorded second fastest time of the day overall with his 1 litre / 61 cui Martlet AS1 running in the E1 racing car class. 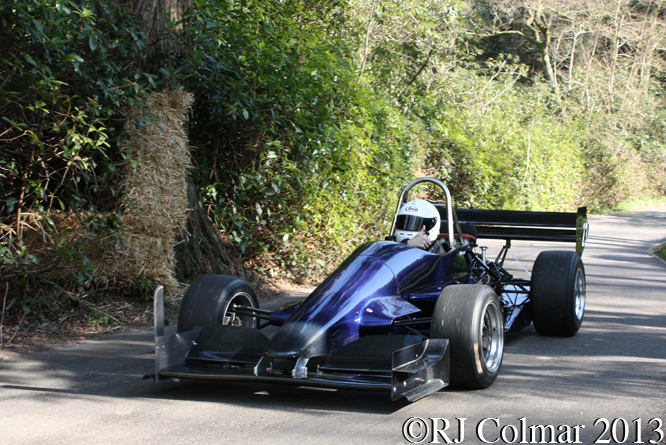 Fastest time of the day was 36.57 seconds recorded by Ed Hollier driving his Pilbeam MP62 in the E2 class. After a fantastic days action it was time to drive home and prepare for a spot of competition myself the following day, full report next Wednesday. Thanks for joining me on this “WMC Championship Hillclimb” edition of “Gettin’ a li’l psycho on tyres” I hope you will join me again tomorrow. Don’t forget to come back now ! 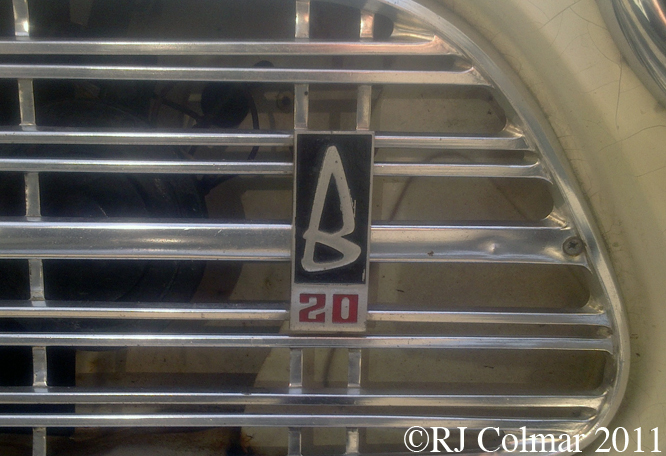 This entry was posted in Uncategorized and tagged Biggs, BMW, Broome, Colmar, Conibear, Cooper, Coote, Crosse, Ensign, Ford, Fraser, GALPOT, Ginetta, Hick, Hillman, Hodson, Hollier, Howells, Hunt, Kayne Special III, Lancia, Lotus, Martlet, MG Metro 6R4 DAM 4100, Moore, Pilbeam, Ralph, SEAT, Smart, Steele, Wadsworth, Wiscombe Park, Woolbridge Motor Club, Wright Audi on May 1, 2013 by Ralph. Last Saturday I had another 6am start, but this time not to go and spectate at an event but to act as a marshall for the The Sunlight Textile Services Pegasus Sprint run by the Bristol Pegasus Motor Club. 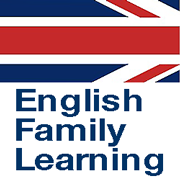 Despite a healthy breakfast which included melon, tangerine, kiwi and a banana by the time I got through signing on I was ready to wolf down a traditional Full English Heart Attack in the Castle Combe Canteen. Even with long johns double layer trousers, three fleeces and a coat I was going to get cold under the cloudless skies with temperatures peaking at 8 degress C but with the wind chill factor making it feel like 9 below zero. In between my second breakfast and the marshalls briefing I managed to snap Jack Taylors 1954 Lotus MG Mk VI this car is chassis #6-18 in theory the 24th Lotus ever built, it’s powered by an MG XPAG motor and appears to have a one off body, quite possibly by Williams and Pritchard though I have yet to confirm that. Wondering around the pits during the half hour lunch break I managed to take a few more photo’s including John Marshall’s Lotus Mk VI, followers of my blogs at the much missed Rowdy.com, and I know there are one or two of you, will remember me originally mis recognising this car as a Lotus 7. 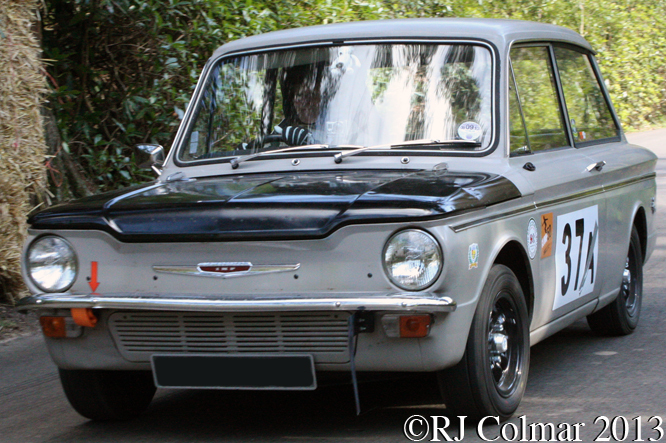 Many mis recognitions since I have found out it was also originally supplied with an MG motor and gearbox which has since been swapped for a Ford 100E motor and Triumph gearbox. In John’s hands this car has won at least 54 trophy’s most no bigger than egg cups. 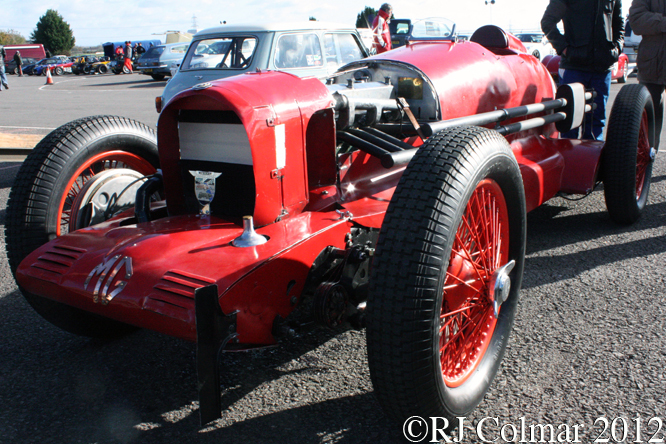 Perhaps the most extraordinary car and for my money cor of the day was Jeremy Hawkes 1933 MG K3, built as on offset single seater to compete at Brooklands where like the 24 litre “Napier Railton” it holds a record in perpetuity, for vehicles up 1100 cc / 67.126 cui having recorded laps in excess of 120 mph. 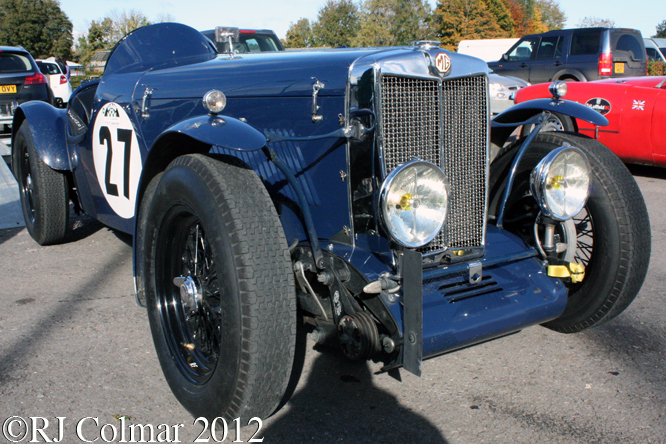 Anthony Smith brought his 1937 MG TA along to compete in the production road going A2 class. 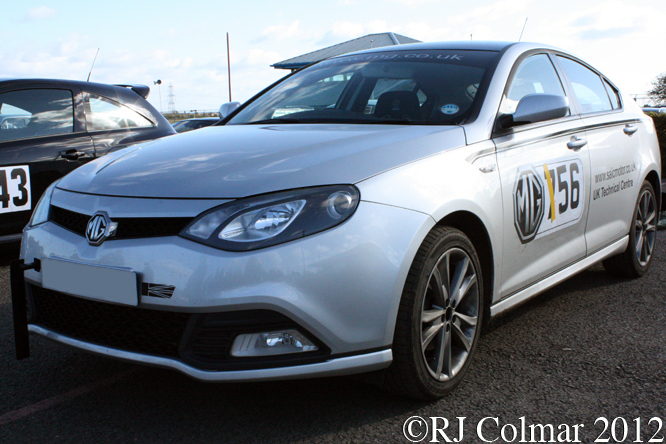 This was only the second occasion on which I have ever seen a contemporary MG A Coupé this one was driven by Martin Wollacot in Class A2. 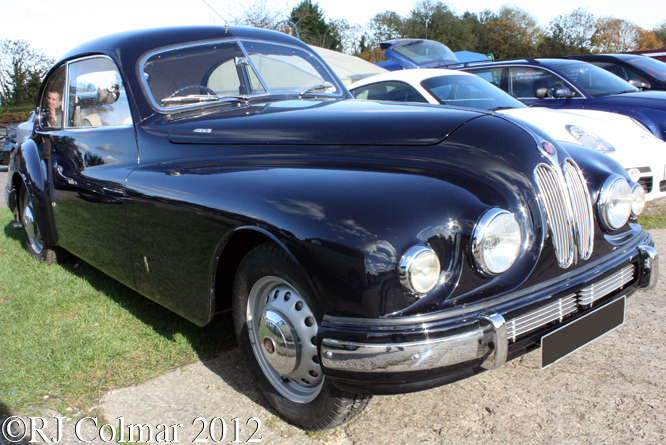 Regular readers might recognise this Bristol 403, which was not competing from the first Coffee Croissant and Cars blog I posted back in April. 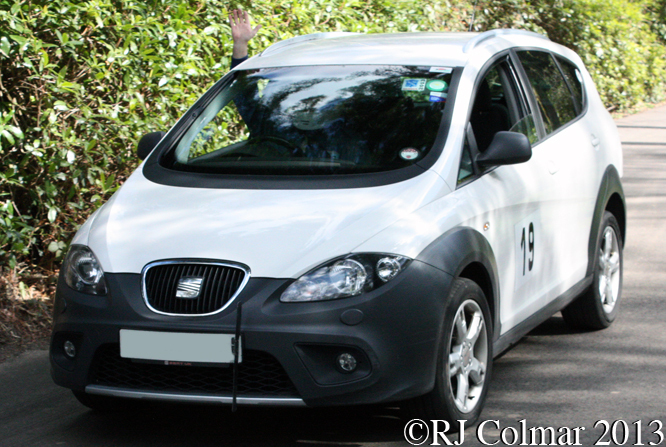 SEAT’s León Cupra R (Typ 1M) was voted 7th best hatch back of all time in a poll conducted by Autocar in 2010, four years after production had switched to the newer Typ 1P. 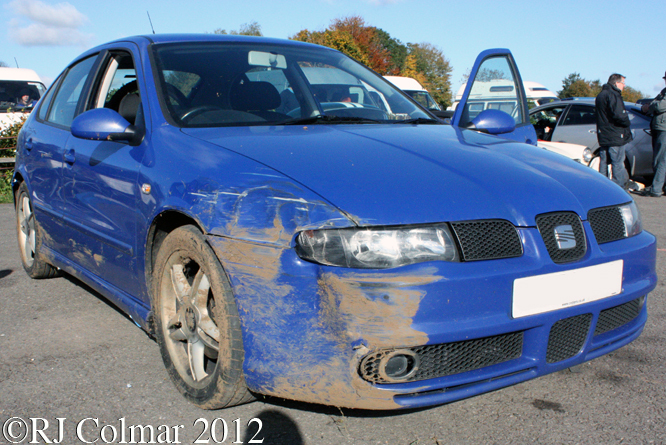 This 2004 Tdi Cupra R shows signs of how tricky the conditions were forcing the brothers who competed with it to go home after the practice sessions were completed to repair the damage which was incurred some where between Avon Rise and Quarry Corner during the second practice runs. 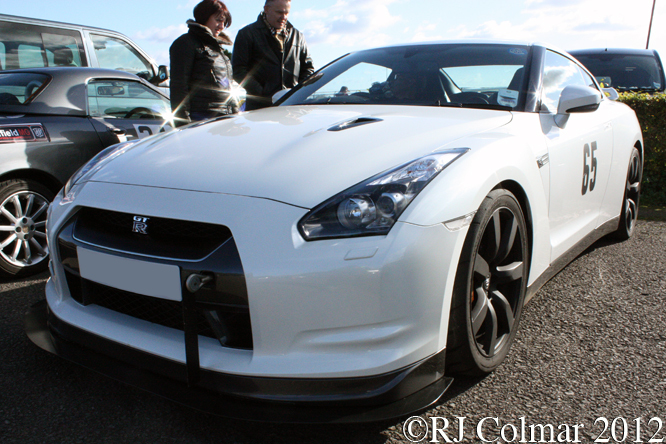 Richard Girling was running his 1st generation 2009 all wheel drive Nissan GTR R35 in the most powerful A4 road going series production class, his car left the factory with 478 hp and a conservative 193 mph capability matched by a rest to 60 mph of 3.2 seconds. Needless to say the car looked quick on the track. 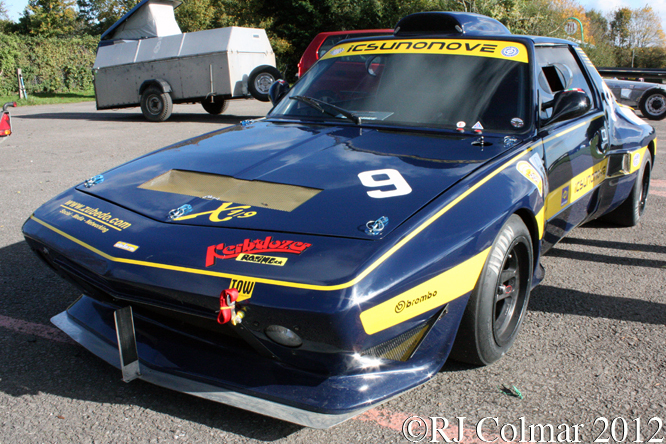 Micheal Kason was running his 2 litre / 122 cui FIAT X1/9 in the modified limited prodiction class C3, notice it sits on slick tyres which would not have been easy to heat up in the prevailing conditions. 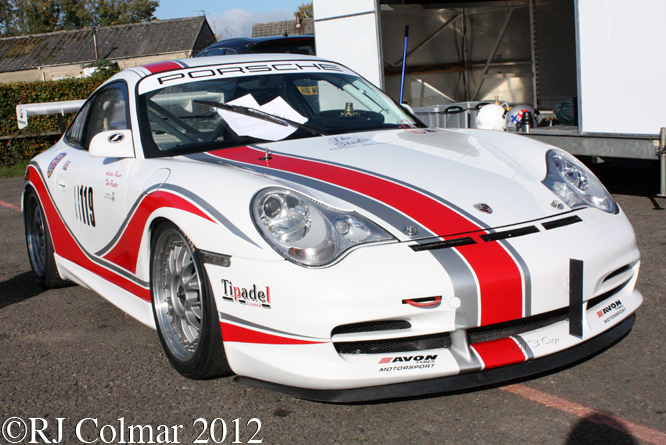 Running in the largest C4 modified production class were Andrew Fraser and Tim Painter in this 2004 Porsche (996) 911 GT3. 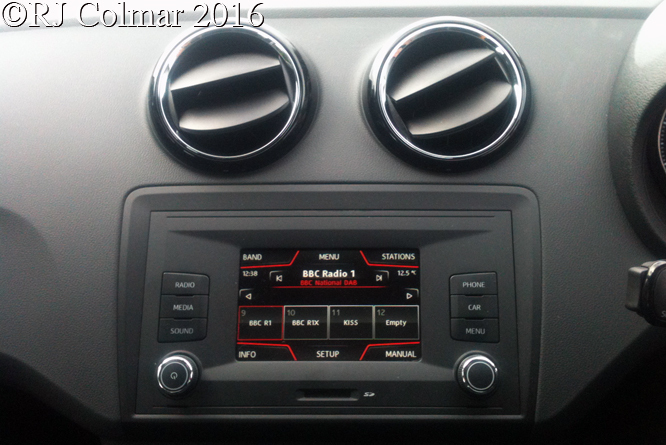 This car is for sale at £37,500, if you would like Andrew and Tim’s phone numbers send me an e-mail and I’ll gladly forward the details, usual disclaimers apply. Last runners of the day were David Hardcastle and Simon Allaby who were competing in the Revington TR / TR Register Sprint & Hillclimb Championship. I did not manage to get many photographs of the on track action but while taking a break from marshaling duties I did get a photo of Ian Hall’s 5.2 litre / Darrian T98 GTR which set fastest time of the day by nearly ten seconds. Thanks to a combination of few too many thrills and spills with short hours of sunlight competitors only got one timed run in before the event started to get too far behind schedule for everyone to get a second time in. Out at Tower we were great full for the hour or so this spared us standing in the delightful sunshine but freezing wind. Thanks for joining me on this “The Sunlight Textile Services – Pegasus Sprint” edition of “Gettin’ a li’l psycho on tyres”, I hope you will join me tomorrow. Don’t forget to come back now ! 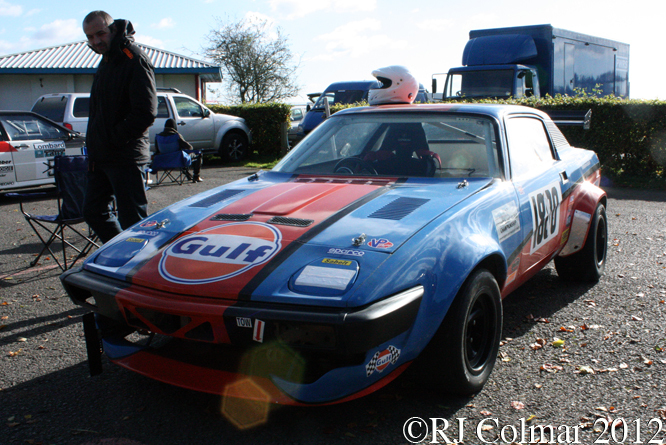 This entry was posted in Uncategorized and tagged Bristol, Castle, Colmar, Combe, Darrian, Fiat, GALPOT, Lotus, MG, Nissan, Pegasus, Porsche, Ralph, SEAT, Services, Sprint, Sunlight, Textile, Triumph on November 4, 2012 by Ralph. 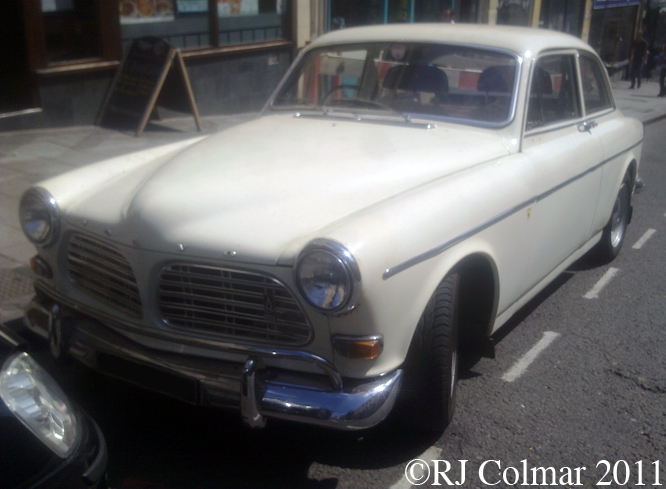 Last week I looked at the Volvo Amazon, no sooner had I written the blog than I came across this Estate / Station Wagon version with Dutch plates. 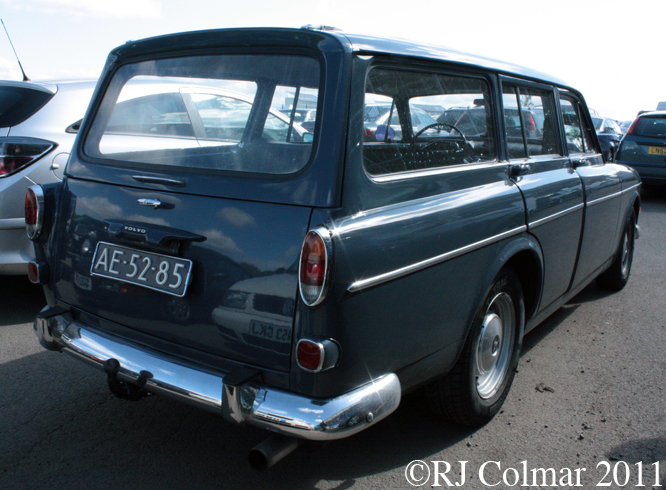 Unlike most modern vehicles of this type the Amazon had a two piece tailgate, the bottom half opens down to form a loading platform while the top half opens up a feature common to many US Estate Station wagons. 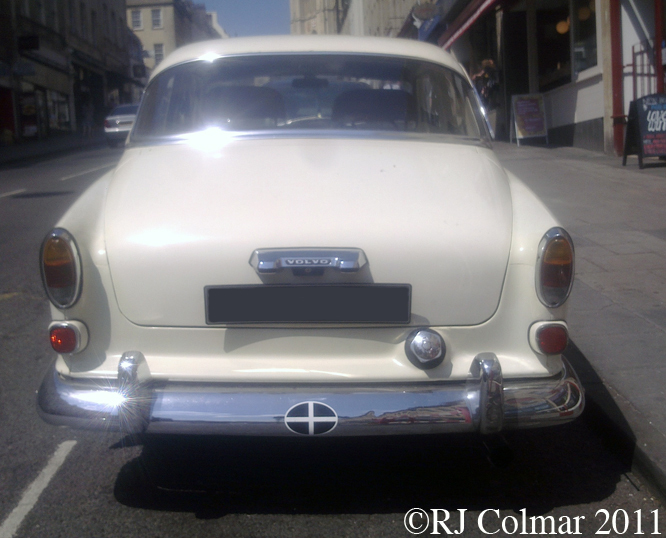 Like the Mini introduced in 1959 the rear licence plate is conveniently hinged at the top so that one can carry longer loads with the tailgate down without attracting the ire of traffic law enforcement agencies. The Amazon Estate / Station wagon was launched in 1962 seven years after the original Amazon Saloon / Sedan, and shared with it’s 3 box sibling body work made of phosphate treated steel to improve paint adhesion and heavy use of undercoat and anti corrosive oil treatment. 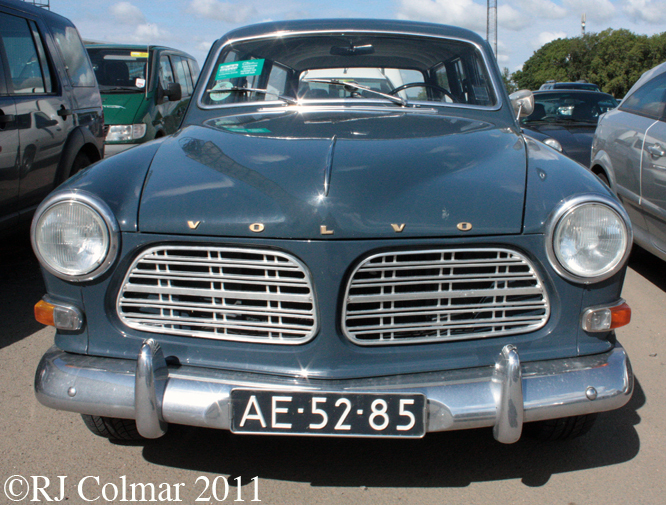 Between 1962 and 1969 Volvo manufactured 73,000 Amazon Estate / Station wagons. Thanks for joining me on this bi-parting tailgate edition of ‘Gettin’ a lil’ psycho on tyres’ I hope you will join me again tomorrow. Don’t forget to come back now ! 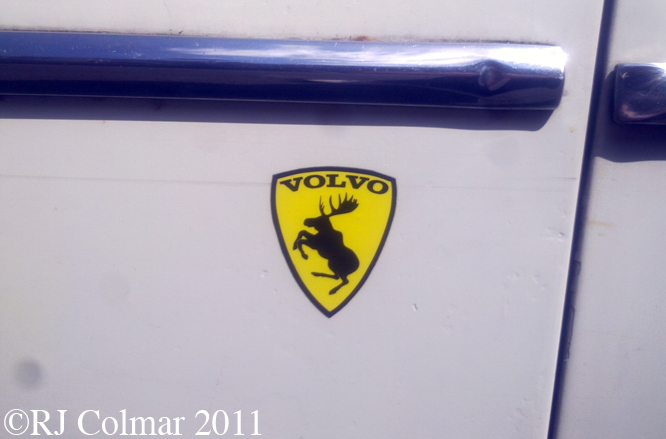 This entry was posted in Uncategorized and tagged 120, 131, 3, Amason, Amazon, Art, Belts, Estate, GALPOT, Jan, Point, SEAT, Station, Tidesco, Volvo, Wagon, Wilsgaard on August 3, 2011 by psychoontyres. Looking back it is a sobering thought that when my four grand parents were born at the turn of the 20th century the invention of motorcar was somewhere between 10 and 15 years old and of them neither of my grand mothers ever learned to drive and only one of my grandfathers ever owned a private car and that only for five years before he died aged 63. Nearly 60 years later I on the other hand was lucky enough to be born into the age of mass consumption by the time I was just four my parents not only had their first new car but all of their friends had new cars too ! 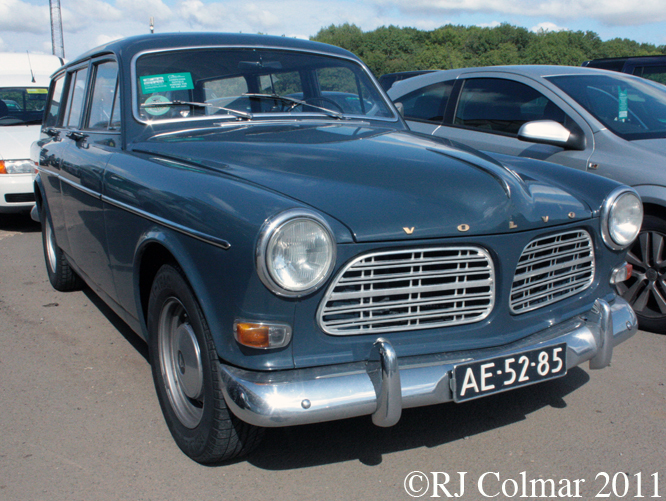 Of those friends my parents had I soon adopted two, Ted and Syd, as my Uncles, both drove brand new grey 2 door Volvo 120 Amazons which had a factory code 131 denoting 2 door single carb versions. Volvo’s original intention was to call the model Amason, however manufacturers, of one of the most irritating sounding 2 strokes ever, Kreidler already had the Amason name registered and so the name Volvo Amason was restricted to Sweden by agreement. 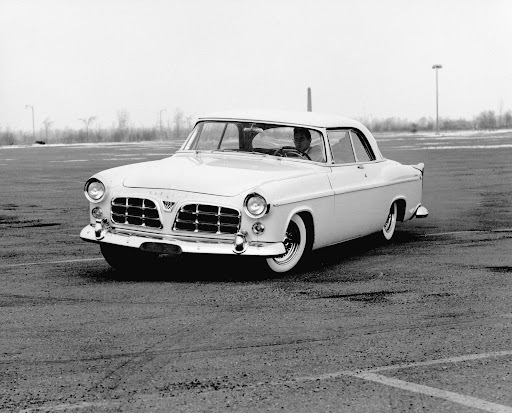 In today’s parlance the Amazon design would probably known as a design mash up with the bonnet lines seemingly inspired by the 2nd generation Chrysler New Yorker, the grill design seemingly from the 1955 Chrysler C-300 though designer Jan Wilsgaard claims he was inspired by a Kaiser Manhattan he saw in the docks in Gothenburg. 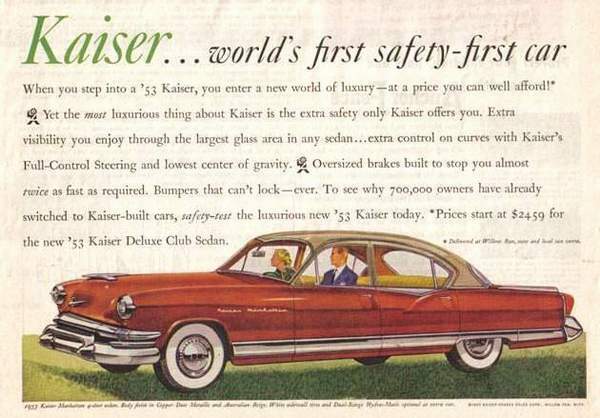 Interesting strap line for the linked Kaiser advertisement in the light of Volvo’s reputation from 1959 until the late 1990’s. During a production run of over 600, 000 units produced in Sweden, Belgium, Canada, South Africa and Chile from 1956 to 1970, in 1959 the Amazon became the first car to be fitted with three point front seat belts as standard. 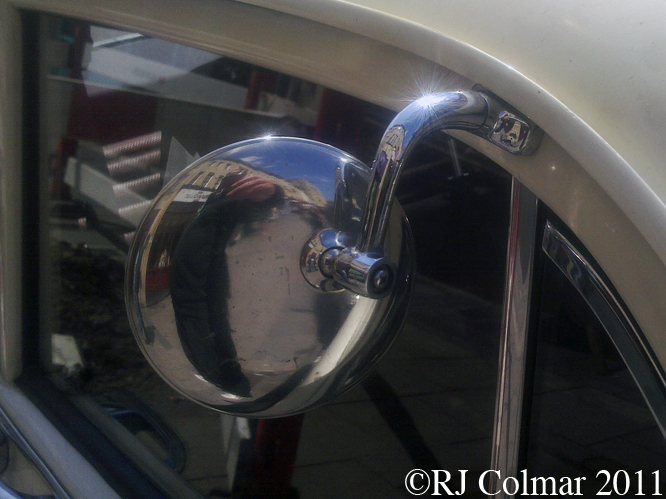 The seat belts fitted in Uncle Ted & Syds cars encouraged my folks to get some after market seat belts for our more modest Austin A40 Countryman, an act that probably saved their lives a year or two later when we were involved in a 30 mph collision with the side of a truck. After 3 years of abuse at BBQ’s on the beaches of Larnica, Cyprus most Sundays and nearly 25 years further good service the last time I saw Uncle Syds Amazon it was rapidly deteriorating into a rust bubble in the mid 1980’s despite the fact that the engine was other wise mechanically sound. The 1970 model shown here seems to have faired considerably better. Thanks for joining me on this Amason edition of ‘Gettin a lil’ psycho on tyres’ I hope you will join me again tomorrow. Don’t forget to come back now ! This entry was posted in Uncategorized and tagged 120, 131, 3, Amason, Amazon, Art, Belts, Chrysler, GALPOT, Jan, Kaiser, Point, SEAT, Tidesco, Volvo, Wilsgaard on July 28, 2011 by psychoontyres. 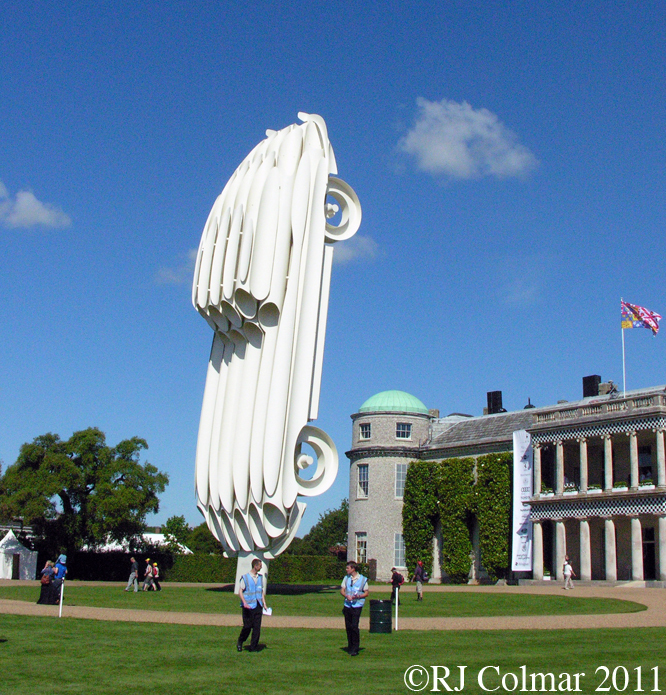 On Thursday I managed to pop in to the Goodwood Festival in the early morning and afternoon. 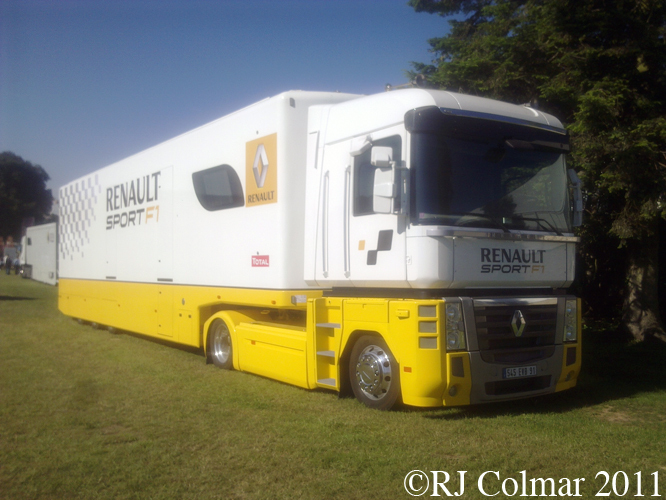 It was one of those mornings when even a the Renault Magnum transporter held a good deal of visual allure. Jaguar was very much the manufacturer under the spotlight of this years Festival, with not only the 50th Anniversary of the E- Type but also the 60th anniversary of Jaguars first victory at Le Mans being celebrated. 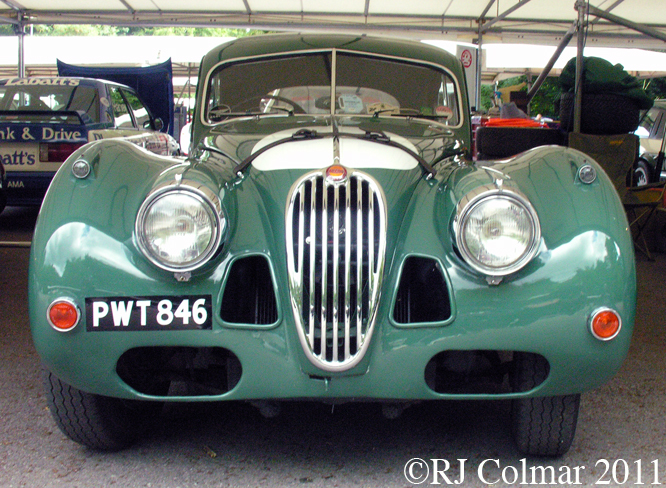 Above the private XK 140 entered at Le Mans in 1956 for Roger Walshaw and Peter Bolton did not finish despite recording 1 lap less than 14th and last classified finisher. Jaguars senior ambassador and former test driver Norman Dewis, extreme right facing camera above, was in evidence amongst the Jaguar exhibits, Norman competed in numerous races for Jaguar and most amazingly IMHO in 1953 he was bolted into an XK 120 and then proceeded to set a production car speed record of 176 mph in it ! 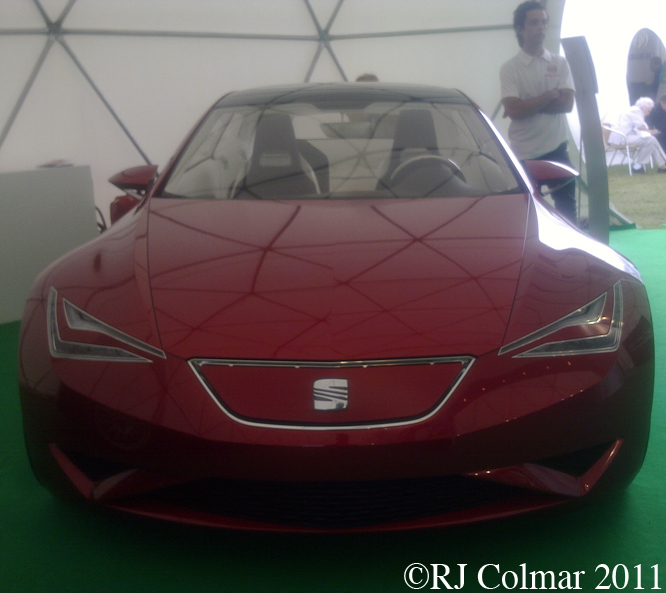 There appeared to be a lot of emphasis on manufacturers efforts to go electric, among the more feasibly stylish concepts was the SEAT IBE, while I am all in favour of zero emissions travel I seriously believe we would be doing our great great grand children a great favour if we talked about these vehicles being ‘DISPLACED EMISSION VEHICLES’ since the power to recharge batteries has to come from somewhere. I wonder if it was a coincidence that in the week when Porsche announced that they were planning to return to Le Mans with a hybrid car in 2014 what must rank as one of the original hybrid vehicles a, Porsche AG built, replica of a 1900 Lohner – Porsche Semprus Vivus powered by two de Dion petrol motors which charge the batteries that drive the front electric hub motors, one of which can be seen above, should appear at the Goodwood Festival of Speed ? 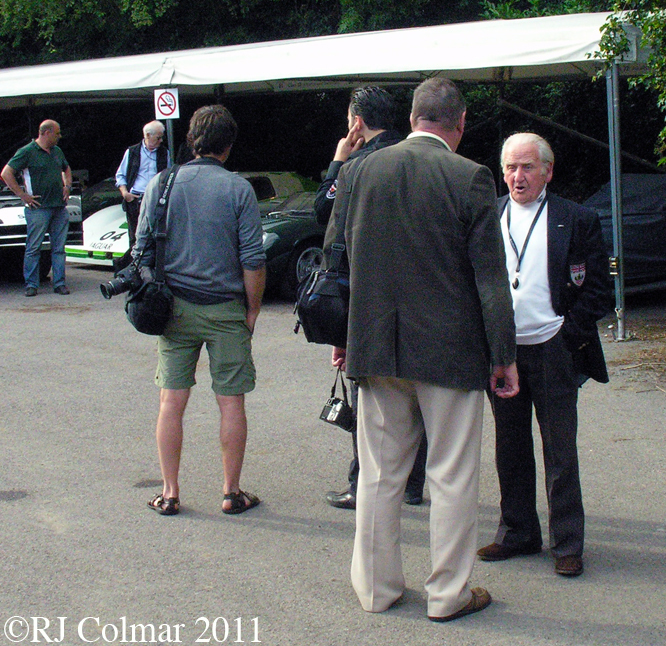 Former Jaguar apprentice Richard Attwood, left with green bottle above, who won the Le Mans 24 hours in 1970 with Hans Hermman driving a Porsche 917 was down to drive the 1965 #9 BRM P261 this weekend, seen also on the left, similar apart from it’s engine size to the BRM he drove to a win at Levin in the 1966 Tasman Series. The action on the hillclimb track at Goodwood on Thursday was restricted to a huge range of road cars being tested by prospective clients in an event known as the moving Moving Motor Show. 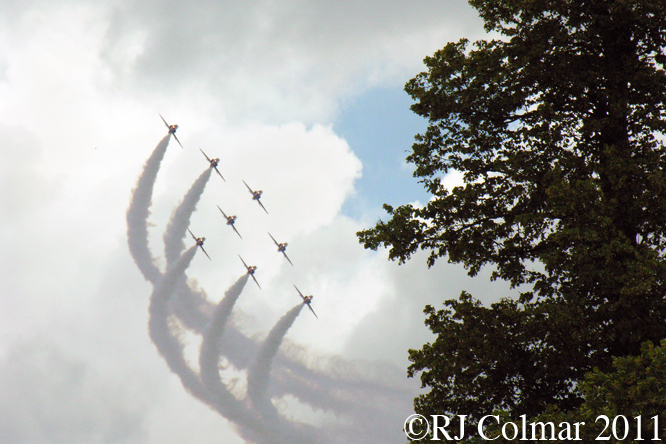 Returning after a lunchtime meeting the tempo of the day was picked up by the Red Arrows who’s display of airpersonship is nothing short of staggering. While the Red Arrow’s Hawk trainer aircraft usually fly around 350 mph during displays and have a top speed of 630 mph they will be left standing by the Bloodhound SSC if all goes to plan when it is completed. 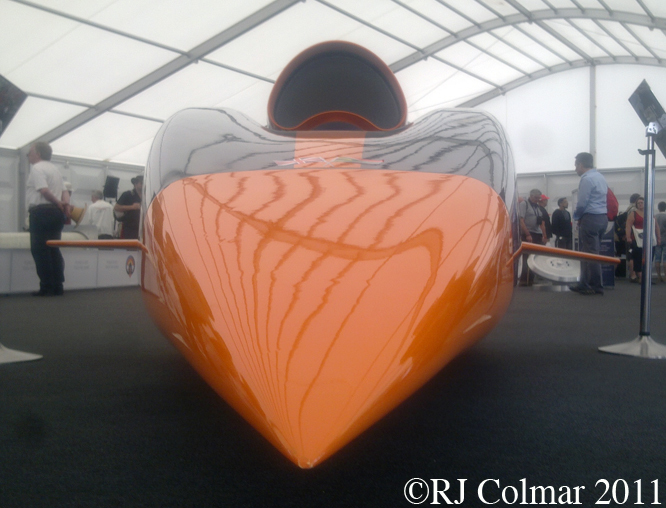 Project founder Richard Noble hopes to have the 14,000 lb 42 foot long car powered by a Eurofighter Jet engine to 350 mph and a rocket, fed oxidiser by a pump connected to Cosworth Formula One motor ready to attempt to take the LAND SPEED RECORD up to 1,000 mph in 2013. 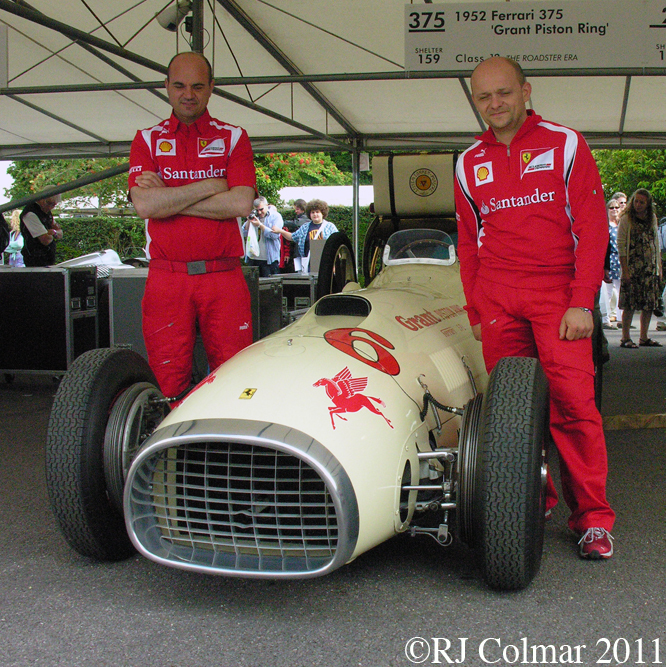 The Centenary of the first running of the Indianapolis 500 was celebrated by a large selection of vehicles from the past 100 years including the Grant King Piston Ring Special Ferrari 375 from the Louwman Museum seen being given the once over by two latter day Ferrari technicians with over 23 years experience working at Marranello between them. 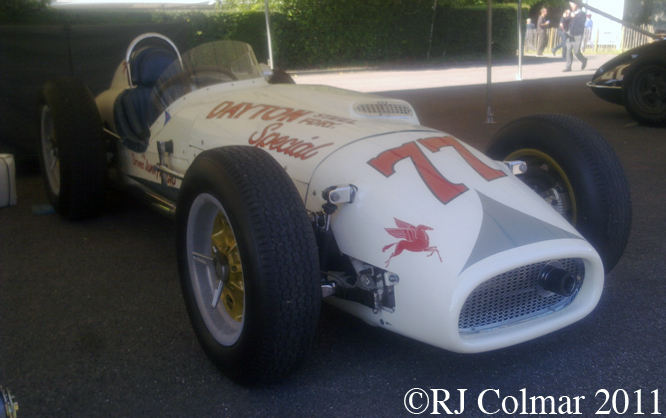 I was advised to look out for the Dayton Steel Foundry Special a Kurtis Kraft – Offenhausser by GALPOT regular and soon to be contributor Dave Wolin, this car was unsuccessful in the hands of Juan Fangio at Indy who withdrew from qualification after trying this car in 1958. Indy Winner Scott Dixon was down to drive the car during the Festival of Speed. 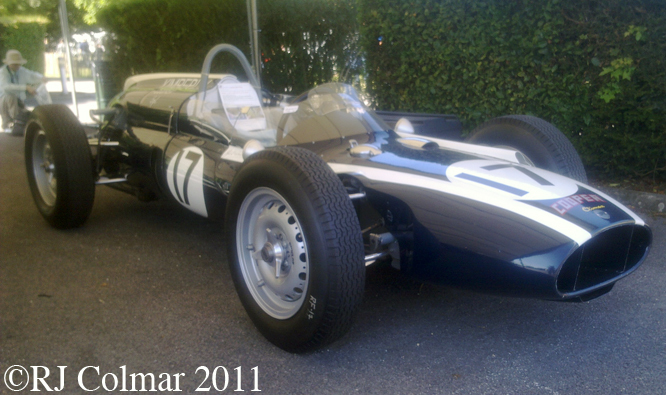 Some of you may remember my blog on The Kimberely Cooper Special a Cooper T54 driven by Jack Brabham at Indy in 1961. Today the car is owned by Philippe de Lespinay, it was a treat to see this car in the flesh and to meet Philippe and his wife Kathryn. 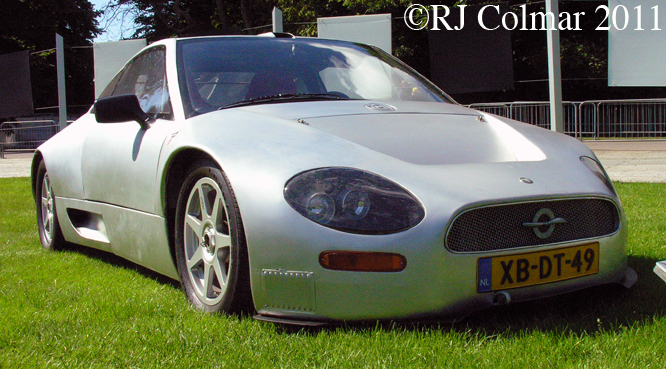 There were a handful of vehicles representing manufacturers that have or at least attempted to have been revived including this 1996 Audi V8 Turbo powered Spyker Silvestris V8 Prototype, which looks like it has been kept in a barn for 15 years while still retaining many of the hall marks although with a tad less testosterone of the current Spyler models. Seeing the Jankowitz Special was a wonderful surprise, though it was very disappointing to see the owner Georg Gebhard embarrass himself by still repeating the myth that discredits the ingenious Jankowits brothers by incorrectly claiming this special was an Alfa Romeo project. 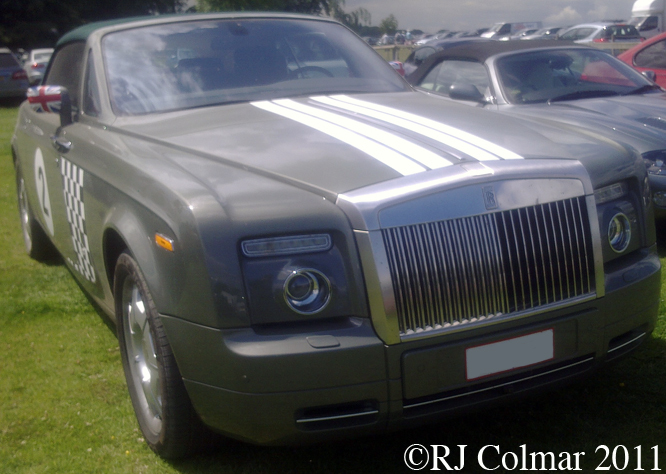 I soon lightened up when I saw this Rolls Royce Phantom Convertible in the car park on the way out. My need for speed satiated by a near perfect day at Goodwood I enjoyed a slow amble home taking the back roads into the sunset through West Sussex, Hampshire and Wiltshire. 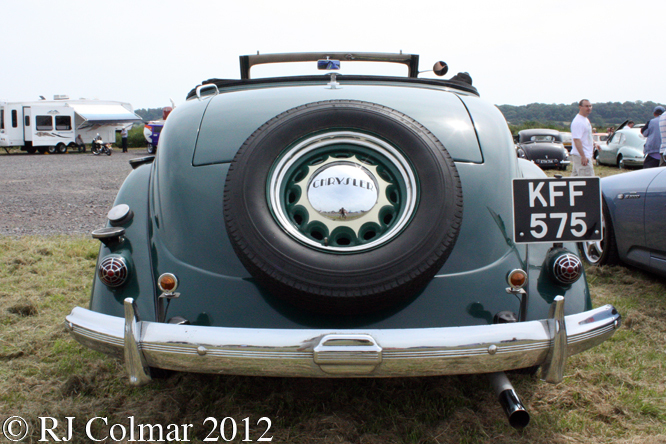 Thanks for joining me on this Festival Speed edition of ‘Gettin’ a lil’ psycho on tyres’, I hope you will join me again tomorrow when I’ll be looking at a European bodied one off special owned and driven by a life long competitor. Don’t forget to come back now ! 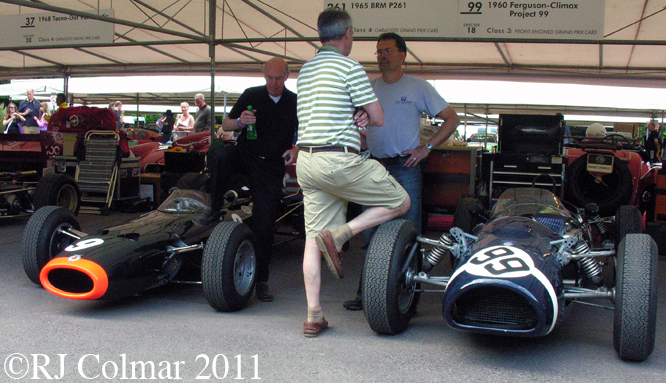 This entry was posted in Uncategorized and tagged Art, Bloodhound, BRM, Cooper, Ferguson, Ferrari, Festival, GALPOT, Goodwood, Jaguar, Kurtis, Lohner, Porsche, Renault, Rolls, Royce, SEAT, Speed, Spyker, Tidesco on July 2, 2011 by psychoontyres.